Rubble, soil, gravel or sand – the HGVs with tipper are the all-rounders on every construction site. 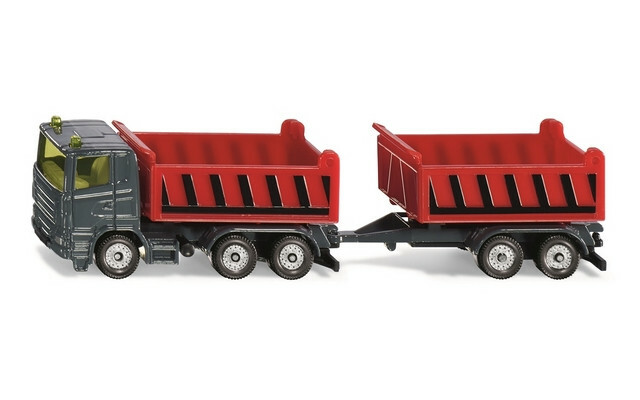 Powered by a strong motor, the tipper pulls a tipping trailer with tandem axle. The tippers can be loaded using the SIKU excavators and wheeled loaders. A toot of the horn and the sturdy vehicles of metal and plastic parts pull off slowly. Having arrived at the unloading site, the tippers can be tipped up and the trailers uncoupled to be unloaded at a second location. The tailgates of the tippers also open.